Some of my readers ask me about how to shoot architecture and buildings appropriately. Best answer I can give is that your photo must tell a story. And you cannot fit a whole "book" into one photo. So pick out one dominant feature that gives the viewer of your photo a very good feeling of being in front of that building / feature in life. Where is the eye drawn first? Of course, there's a heap of technical stuff to get right, as well e.g. exposure, optimum light, optimal depth of field, etc. Take a look below at a shoot I did for valued client, FIRESPEC at 11 Adderley Street Cape Town. The theme of this shoot was the dominant red paneling applied to the walls of the building looking into the atrium. 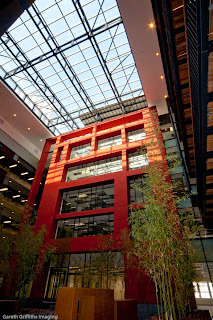 The pics below show how sections can be used to good effect, due to the massive nature of the building within the atrium. This pic shows some distortion. Not surprising, since the lens was taken back to about 15 mm !